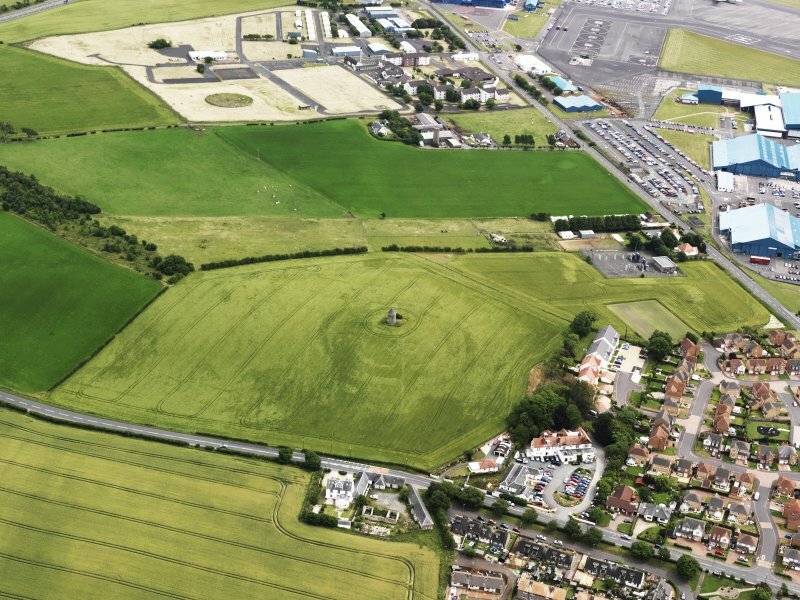 Oblique aerial view of the cropmarks of the fort, and the windmill and dovecot, taken from the NW. 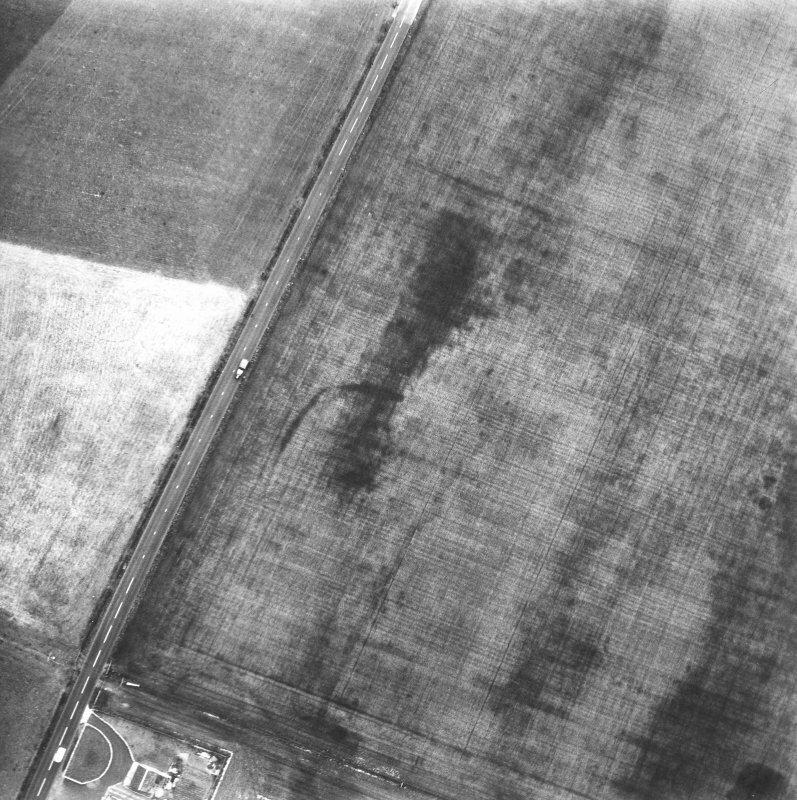 General oblique aerial view of the cropmarks of the fort, and the windmill and dovecot, taken from the NW. 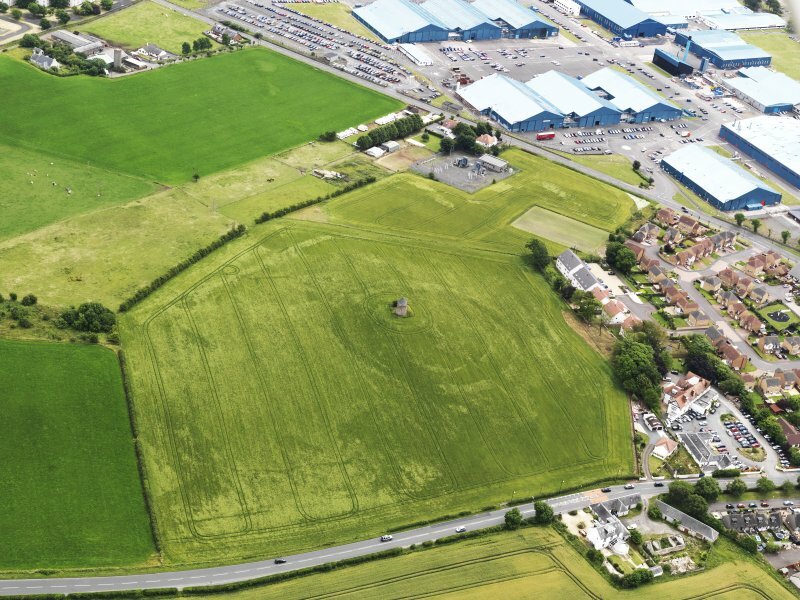 Oblique aerial view of the cropmarks of the fort, and the windmill and dovecot, taken from the WNW. 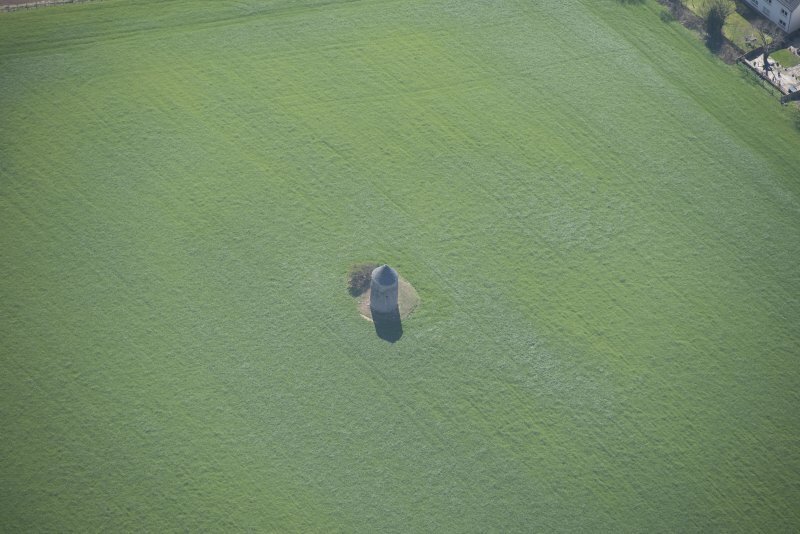 Oblique aerial view of Whiteside Dovecot, looking E.
The stump of a tower mill about 30ft high and 12ft in diameter stands on an artificial mound which houses an arched underground cellar, projecting about 15ft from the basement of the tower under the main floor. It is a classic example of the vaulted tower mill (Class 2) and dates from the early 18th century. It was converted to a dovecot in the early 19th century and is roofed and in good condition. This mill has been re-roofed and slated and remains in a stable condition. The internal nest boxes have been removed. The shell of an 18th century vaulted windmill is situated 530m NE of Monkton old parish church (NS32NE 1). The tower (3.35m in diameter at ground level within walls 0.9m thick) which rises from a base plinth and is slightly tape red, comprises a basement and two storeys; the slated conical roof is a more recent addition. Opposed doorways are set at ground level and there are two single-light windows on the first floor; a larger opening is of more recent date. On the S the basement opens into a barrel-vaulted chamber (up to 7.1m long by 3.35m wide). During the early 19th century the tower was converted for use as a dovecot. Travelling around the west of Scotland, one is struck by the large numbers of watermills, now often converted into coffee shops, galleries and even museums. Their ubiquity is testament to the damp climate and rugged terrain which characterises this part of the world. These structures were originally built in order to harness the energy in flowing water, powering the early stages of our agricultural and industrial revolutions. We find this energy source revisited today in the form of hydropower turbines; at the same time, we mustn’t forget the backbone of renewable energy, wind, which also has a historic origin – the windmill. Monkton Windmill is a rare survival from the use of wind power in the 18th century, and is one of only two such structures remaining in Ayrshire, the other at Ballantrae. 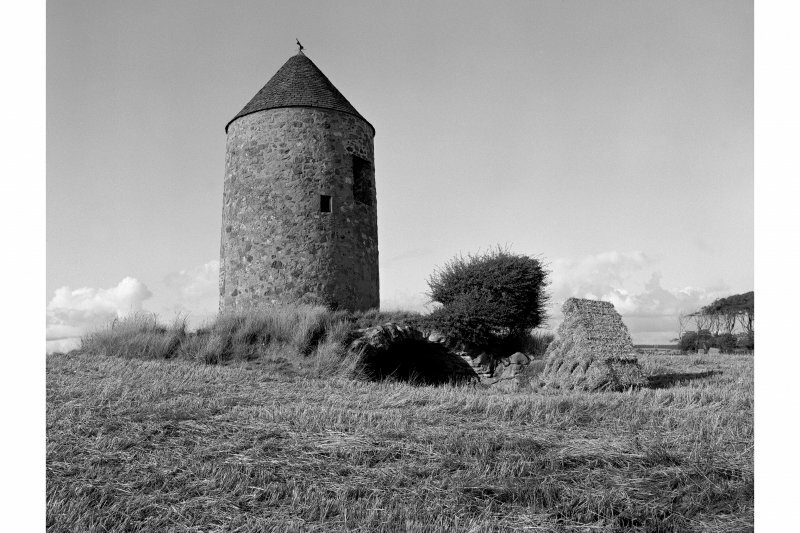 A two-storey tapering tower with slated conical roof and weathervane, it stands on a ridge above Monkton and Prestwick airport and within the cropmark of a much earlier hillfort. Visible across a large swathe of the county, this tower has become an iconic landmark to those travelling by – though many, if not most, do not know its origin and history. Our windmill has been described as ‘a classic example of a vaulted tower mill’ (Donnachie & Stewart, 1967, 288) used for grinding grain of various kinds. The circular tower would have been surmounted by a rotating windcap supporting 4 sails, with the upper floor housing the wind shaft, main shaft and machinery for the windcap. The drive carried the generated, rotating power down to the lower, ground, floor to turn the millstones. Opposed doorways at ground level and single-light windows on the first floor would have enabled through-flows of people, materials and air across floors that would have been very constrained in terms of space. The initial description reveals the secret of this type of mill; it was built on an artificial mound that conceals a vaulted chamber, giving it a basement level. The creation of this basement, acting as receiving and dispatching room, enabled a relatively small windmill to be combined with a much larger store. Hoppers would have carried the grain up to the millstones on the ground floor, with the finished meal conveyed into the vaulted basement. This is an elaborate, specialist structure that was a costly investment. By the end of the 18th century a landowner building a windmill would have spent up to three times the money required for a watermill – so why do we have such a fine windmill here at Monkton, on the not-always-so-dry west coast? After a childhood in poverty, James Macrae became a wealthy man in India, in part as the Governor of the Presidency of Madras (1725-30). He returned home to Ayrshire in 1736, purchased Monkton House and estate and renamed it ‘Orangefield’, reflecting his admiration for William of Orange (William II of Scotland). Macrae used his wealth to establish his position in Scottish society. Sometimes this was accomplished through a grand gesture (in 1735 he gave Glasgow an equestrian statue of King William that now stands in Cathedral Square), but much of his expenditure went on the expansion and modernisation of Orangefield. This may have included erecting our windmill on the ridge above the estate, although the mill has been assigned to the 17th century, or the early 18th century by some architectural historians. The prominent, if not exposed, location would have provided strong, steady winds for the sails of our windmill – so in part this is a very functional position. But we need to recognise that the location also stood next to the road falling down to Monkton from Kilmarnock that in the 18th century weaved its way down this ridge. This same location also overlooked both Orangefield House and the village of Monkton. So for Macrae this investment might also have been an important social statement about change, progress and his wealth. 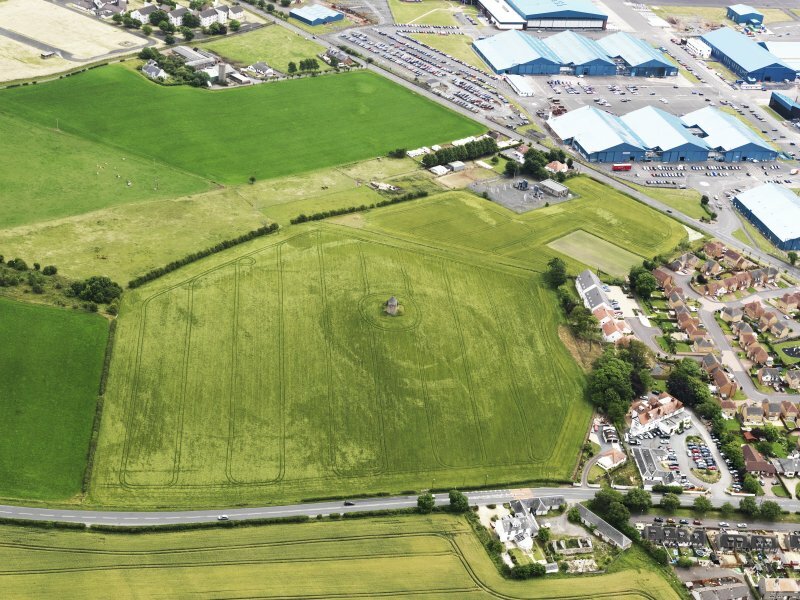 It is no coincidence that Roy’s Military Survey of Scotland (1752-55) which depicts the windmill also names the ridge ‘Crorehill’ – Crore being a borrow word from Urdu used to denote 10 million in currency. This was a self-made man, returned from extracting wealth in the emergent Empire, who sought to change the landscape around him, even to the point of renaming elements within it. Many of the changes made by Macrae have not endured, the process of transformation he envisaged being cut short by his death in 1746. By 1795 his fortune - passed down two generations to James Dalrymple - had been wholly spent, if not frittered away. We know that the windmill was still in use in 1775 as Armstrong depicts it on the New Map of Ayrshire, but by the mid 19th century, it was no longer being used for this purpose. The floors and machinery had been removed, the caphouse and sails taken down and a conical roof added in their place. Rows of nesting-boxes were fitted into the tower and an internal revolving potence (ladder) added which allowed access to the upper levels. Our agricultural power house had become been repurposed into a doocot, a secure a home for pigeons and doves that were kept by landowners as a source of eggs, flesh and dung. By the 19th century many doocots had also taken on a role as an ornamental feature within a landscape – and this became, in time, the dominant role of our windmill. 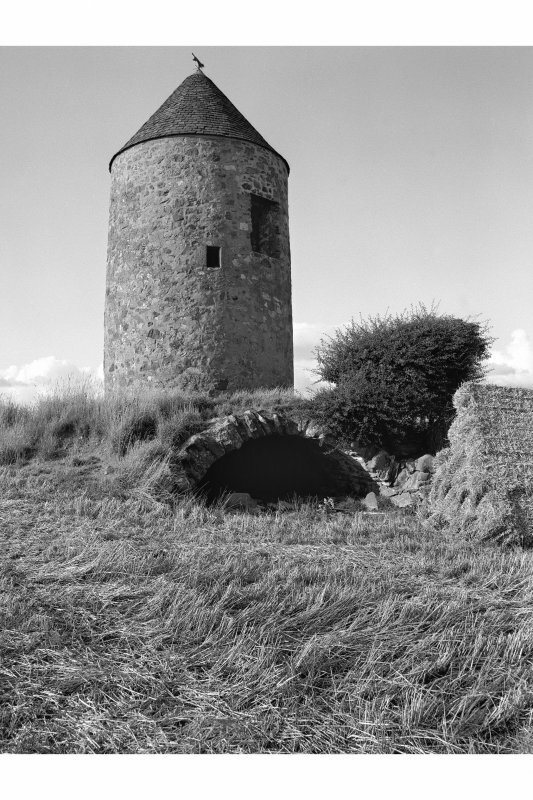 The fittings of the doocot are long gone, but the tower and its hidden vaulted basement remain, standing proudly on the ridge overlooking the Ayrshire coast and inadvertently connecting this corner of Ayrshire with the wealth brought away from distant Madras.